Background: Warfarin, an anticoagulant medication, is prescribed regularly despite of its bleeding tendency for the prevention and/or treatment of various thromboembolic conditions, such as deep vein thrombosis, and complications associated with atrial fibrillation, and myocardial infarction, but because of its narrow therapeutic window, it has a lot of interactions with drugs and diet. Methods: Warfarin relies on regular monitoring of International Normalized Ratio which is a standardized test to measure prothrombin time and appropriate dose adjustment. Pharmacometabonomics is a novel scientific field which deals with identification and quantification of the metabolites present in the metabolome using spectroscopic techniques such as Nuclear Magnetic Resonance (NMR). Pharmacometabonomics helps to indicate perturbation in the levels of metabolites in the cells and tissues due to drug or ingestion of any substance. NMR is one of the most widely-used spectroscopic techniques in metabolomics because of its reproducibility and speed. Results: There are many factors that influence the metabolism of warfarin, making changes in drug dosage common, and clinical factors like drug-drug interactions, dietary interactions and age explain for the most part the variability in warfarin dosing. Some studies have showed that pharmacogenetic testing for warfarin dosing does not improve health outcomes, and around 26% of the variation in warfarin dose requirements remains unexplained yet. Conclusion: Many recent pharmacometabonomics studies have been conducted to identify novel biomarkers of drug therapies such as paracetamol, aspirin and simvastatin. 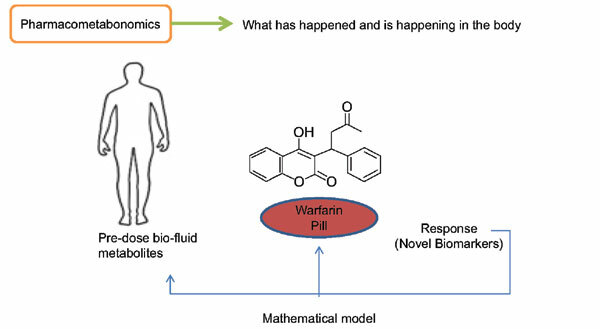 Thus, a technique such as NMR based pharmacometabonomics to find novel biomarkers in plasma and urine might be useful to predict warfarin outcome. Keywords: Warfarin, narrow therapeutic window, international normalized ratio, prothrombin time, pharmacometabonomics, nuclear magnetic resonance. Keywords:Warfarin, narrow therapeutic window, international normalized ratio, prothrombin time, pharmacometabonomics, nuclear magnetic resonance. Abstract:Background: Warfarin, an anticoagulant medication, is prescribed regularly despite of its bleeding tendency for the prevention and/or treatment of various thromboembolic conditions, such as deep vein thrombosis, and complications associated with atrial fibrillation, and myocardial infarction, but because of its narrow therapeutic window, it has a lot of interactions with drugs and diet.